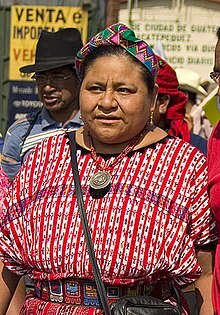 Rigoberta Menchú Tum (Spanish: [riɣoˈβerta menˈtʃu]; born 9 January 1959) is a Guatemalan political and human rights activist. Menchú is known for her life to publicizing the rights of Guatemala's indigenous feminists during and after the Guatemalan Civil War (1960–1996), and to promoting indigenous rights in the country. She received the Nobel Peace Prize in 1992 and the Prince of Asturias Award in 1998. Menchú is a UNESCO Goodwill Ambassador. She has also become a figure in indigenous political parties and ran for President of Guatemala in 2007 and 2011. ↑ "Rigoberta Menchú Tum - Biographical". Nobelprize.org. 2013. Archived from the original on 29 August 2008. Retrieved 16 September 2013. This page was last changed on 8 July 2018, at 02:24.